There’s no better way to celebrate this magical time of year than with a delicious festive cocktail. 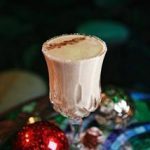 Available from 17th December and created by bar manager Brent Flowers, Dragonfly presents to you Dragonfly Egg(nog) (HKD130), a unique twist on the favourite traditional Christmas drink. It includes a mix of Coconut Rum, Bourbon, a sweet coconut cream, vanilla, and star anise topped with crushed hazelnuts, grated nutmeg and a Santa-Claus-shaped chocolate burnt on glass for an added festive touch.